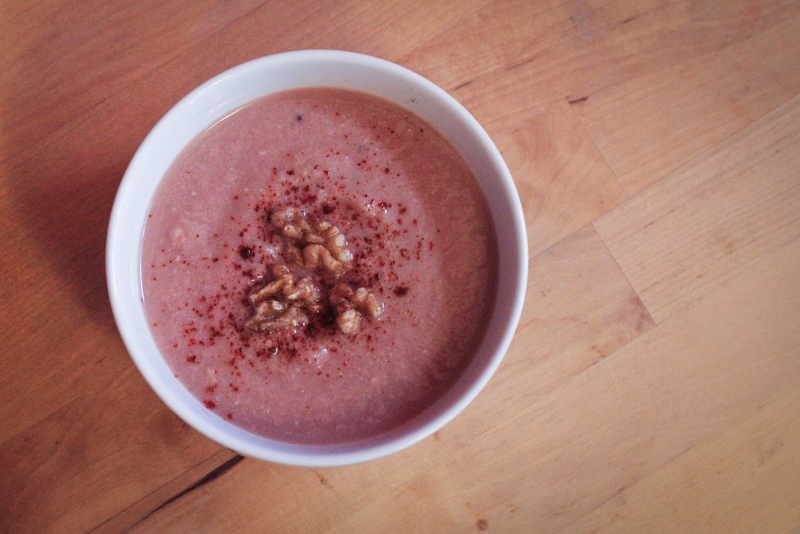 30b30#4.3: Purple Cauliflower and Walnut Soup | As I blog. I'm a sucker for color. It's more expensive and has no discernible difference in taste, but I had to have the purple cauliflower over the white because, well, it's purple! It's purple because it contains anthocyanin, plant pigment molecules that can appear red, purple, or blue, depending on the pH. They're also found in wine and red cabbage and can act as an antioxidant, so they may have some extra health benefits... yup, I'll use that as my justification. 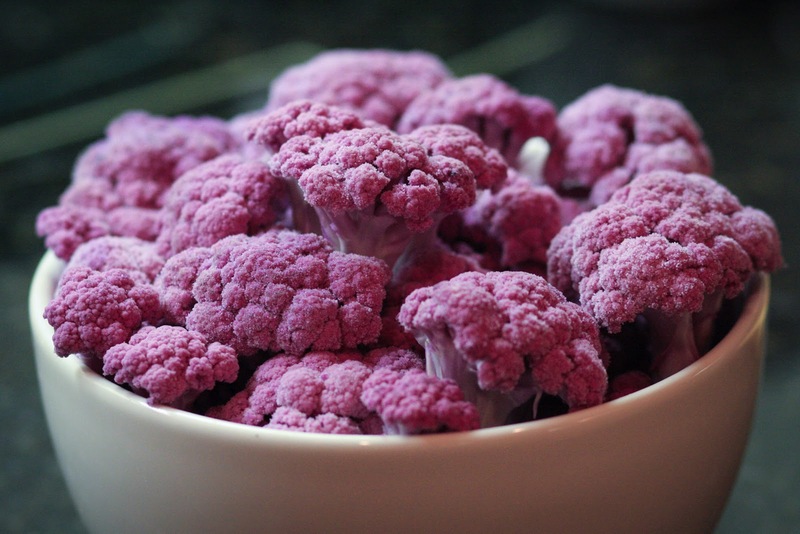 Anyways, Dawn and I picked some of this pretty cauliflower up from the farmer's market and made an ultra-simple, particularly healthy, particularly purple soup. The picture is kinda crap, and will be added to my ever growing pile of crappy indoor photos, but the soup was good. It's ultra-simple to make and has a nice creamy texture, without the cream. I'd make this one again and recommend it if you need a quick, light, and healthy meal. Based on "Cauliflower and Walnut Cream Soup" from SOUP. Trim the cauliflower and break into small flowerets. Roughly chop the onion. Place the cauliflower and onion and stock in a soup pot. Bring the stock to a boil, then cover and simmer for 15 minutes. Add the milk and walnuts and then puree until smooth. Serve with paprika and crushed walnuts. Can I just say (and I am sure it is delicious) that the walnuts look like little chunks of brain floating on the soup? I shall call it zombie soup! So, the actual soup color is quite purple-grey-pureed-brainish too. I agree with the renaming!